In its earliest iterations, Synergy was a transdisciplinary, community-issues, problem-solving course, first offered at The Westminster Schools’ Junior High School in the fall semester of 2010. (At Westminster, it was named Synergy 8 because it was specifically rolled out for eighth grade.) For two years prior to its launch, I designed the framework of Synergy based on research that I had done with Dr. Frank Pajares and Dr. Carol Hahn at Emory University and informed by continued research on authentic learning and PBL (project-based learning, problem-based learning, passion-based learning, etc.). The central tenets of Synergy radiate from the strong belief that young people can — and want to — do mighty things to impact their communities positively and that school should be more like real life, empowering students to engage with community as citizen leaders. Synergy, the name, pays homage to the fact that real-life difference making requires more-than-the-logical-sum-of-the-parts synergy of many people and disciplines. In the spring of 2010, I invited Jill Gough to co-facilitate the Synergy 8 experience, and we co-designed and co-created Synergy 8 during the 2010-11 and 2011-12 academic years. In those two years, Synergy 8 existed as three one-semester courses, and each semester served 24 student-learners. 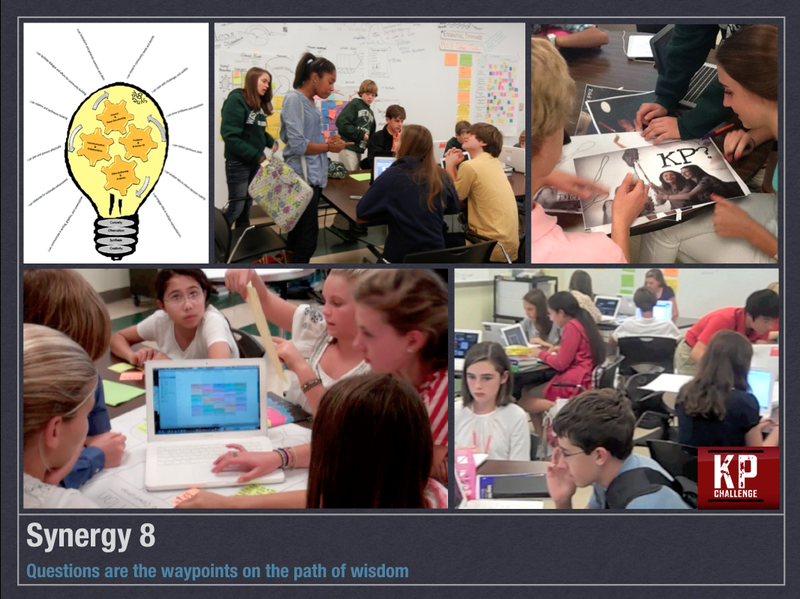 Without a doubt, the student-learner members of the Synergy 8 teams partnered with us amazingly to improve the Synergy model – they were our co-creators. Jill and I also presented nationally and consulted extensively to spread Synergy to other schools and educators. In June of 2012, Jill and I left Westminster (I went to Unboundary, and Jill went to Trinity School), and Synergy 8 continued as a course in 2012-13, co-facilitated by Bartley Griffith and Laurel Bleich. Westminster discontinued Synergy 8 at the conclusion of 2012-13. The core principles and insights of Synergy continue at many schools, and I bring the evidence-based philosophies and experiential practices of Synergy into practically all of my continuing work as an educator and learner-preneur. Thanks to Synergy, I’ll never see the world of learning the same way ever again. From these four domains, we articulated 12 essential learnings, and these desired learning outcomes became the bedrock of our feedback structures and intensive assessment. Our entire rubric system and our methods of self-, peer-, coach-, and community-assessment organized on these four domains and 12 essential learnings. All of these “filaments” and “rays of light” emanated from the habits of mind: curiosity, observation, synthesis, and creativity. The Synergy team grew tremendously in the often-called “4Cs” of 21st century skills: communication, creativity, collaboration, and critical thinking. However, we saw these skills as leaves on the tree. I believe that curiosity is the taproot that feeds the entire, living tree. Learners having a high locus of control and agency for self-determined direction, then, forms the solid and strong trunk of the metaphorical tree. And deep caring for the community and application of knowledge and understanding support the 4Cs leaves as the network of branches. Observation journaling served as the backbone of the course. Members of the Synergy 8 team regularly contributed observation journal posts generated from virtually anything that sparked curiosity and questioning for the observer. As described in Innovator’s DNA, observing is a fundamental characteristic for being an innovator, and discovery is foundational to design thinking. Through our observation journals in Synergy, we discovered our possible projects – PBL emerged because we practiced seeing. If observation journaling was the backbone of Synergy, the Beta Projects were the heart and soul of the course. Through data mining and pattern finding, student learners studied the ever-growing collection of observation journal posts and identified community-issues projects into which they would pour themselves and their efforts as strategic designers and citizen leaders. health and the obesity epidemic in the U.S.
From its inception, Synergy 8 was billed as an experience that would be heavily assessed but non-graded. The learners on the Synergy 8 team relied on intense assessment and feedback. Our feedback loops included self-assessment, peer-assessment, facilitator-assessment, and network-assessment. Because we were working on projects that mattered well beyond the typical grading constraints of school, the student-learners quickly learned to value and crave feedback from various angles and perspectives – such insight sharing and inquiry was not ever meant as personally judgmental, but as bettering the iterative outputs that the team was producing. Because Synergy 8 was a part of the system of school, we did build a system of rubrics so that feedback could often be targeted toward the growth and development of the essential learnings of Synergy 8. In the paragraphs above, one could read about the “backbone” of Synergy, as well as the “heart” and “soul.” Well, then, design thinking was the blood circulating throughout the veins and arteries of Synergy 8. Too often in school, the adults – the teachers – and the textbooks typically do most of the problem definition for students. In Synergy, though, problem definition was the course of action and informed solution seeking the driver. The team employed the methods and practices of design thinking in order to explore their communities, to gather insights and generate hypotheses, to gain empathy for those affected by the challenges and potential solutions, to prototype and iterate ways of addressing community needs, and to evaluate the impact and forecast future directions of progressive next steps. As you may know, I graduated two weekends ago. We were lucky to have great weather which made for a fun graduation weekend. As my time at Westminster was coming to an end, I reflected upon all my years there and I thought of you. I just wanted to let you know how blessed I am to have had you in my corner since middle school. I sincerely appreciate how supportive you’ve been of me, whether in Synergy or as I ventured into the 21st C education space on Twitter or with my blog and Student Voice. 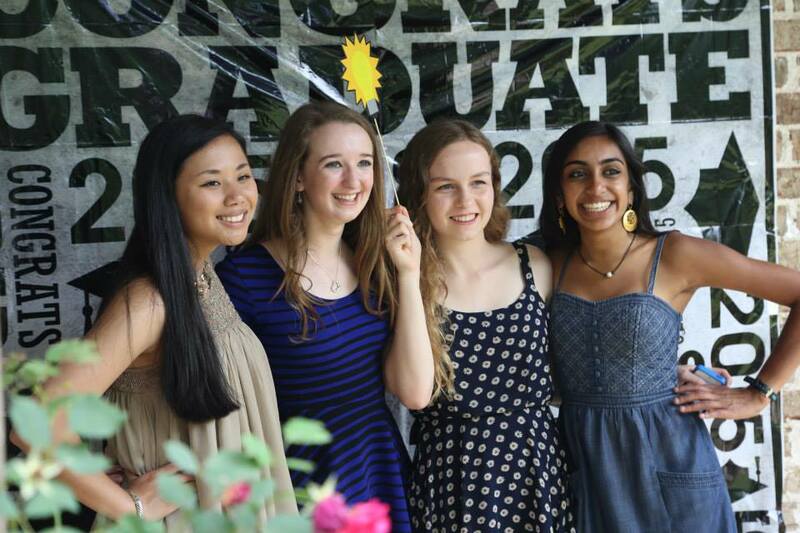 At one of the graduation parties, Sarah, Amanda, Ella and I took a “synergy picture” (attached) with a lightbulb that to this day reminds us of your class. If it wasn’t for Synergy, I doubt I would have been friends with any of those girls, and certainly never would have been as close with two of them as I am now. I have you to thank, not only for those important friendships and connections, but also for setting me on a path that led me to work and an organization that I cherish, that has itself been a springboard for many opportunities. When asked what got me interested in education, one word always springs to mind– Synergy. The course itself may not have sparked an earth-shattering project but the mindset it helped me develop and the perspective it gave me, have undoubtedly shaped who I am today. For that, and for everything else, I wanted to say thank you. Hope to see you soon, hopefully before I head to Washington D.C.